The Mayor, Cllr Nick Farrar, and Mayoress, Mrs Angela Farrar. Honoured guests, ladies and gentlemen, councillors and members of my family and friends. I am proud and honoured to stand here as the elected Mayor of Hayle for the following year. My fellow councillors have given me a great privilege and responsibility, and I express my sincere appreciation for placing your trust in me. I would especially like to thank Jayne, our angel of the North, and Graham for their kind words. I take this responsibility and the trust you have shown very seriously. I commit to serving the people of Hayle to the best of my abilities with enthusiasm, compassion and devotion, and offer my full support to our Clerk Ellie and the other members of team Hayle, Caroline, Karen, David, Rose and newest member, our gardener Olivia. Welcome to the Hayle Day Care Centre, this wonderful establishment, which helps the elderly of Hayle, St Ives and beyond offering a warm friendly welcome with the offer of terrific food, comfort and amazing staff. I am pleased to announce that tonight’s refreshments have been prepared by the staff of the day care centre and I thank them for their hard work; I would like to announce that my charity for this year will be the Hayle Day Care Centre. I would also like to thank the ladies of the flower club for the lovely arrangements. Why does anyone become a councillor? Well for me, the trigger was 14 years ago when we lost our son Jamie. Immediately afterwards we were offered help, love, advice and compassion from the whole town, from people we didn’t know that well, but had heard what happened and wanted to help us. We had visits from town councillors, most notably Cllr Terri Lello, Cllr Marjory Roberts, Cllr John Coombe and his wife Lorna; all came to offer support and kind words. Later tributes came from the whole council by naming a street after Jamie, and after we raised some money through sponsored bike rides and other events, plaques were placed near to equipment that those funds helped finance. Walking around our town and seeing evidence of the love we received, helped us as a family to come through our grief and focus on the future. From seeing the good that people can do, it became an ambition that one day I would be in a position to repay some of that kindness by becoming a councillor, and today I stand here further in debt to my colleagues and the people of Hayle as your Mayor; Hayle is a town that just keeps on giving. Hopefully now as your Mayor I can give back some of what Hayle has generously given me. Over the last two years I’ve been privileged to be Graham’s deputy, and to Graham and the other Mayors that have served since I have been a councillor, I thank you for the exemplary manner in which you have fulfilled the role; I have a lot to live up to. I have been honoured to Chair our Amenities Committee, and with help from Cllrs Capper, Coad, our Clerk, Cornwall Councillors Pollard and Coombe and officers from Cornwall Council have overseen the improvements to our Recreation Ground, Plantation, Mill Pond and other sites in Hayle, being particularly proud of the way the Recreation Ground has been transformed. It is my wish that the Recreation Ground has a piece of inclusive play equipment installed, enabling children of all abilities to enjoy the area, and with support from the council this is moving closer to reality and is one small way to pay some of the good stuff forward. Next year will see the 20th anniversary of our town’s twinning with Pordic in Brittany, and I am looking forward to helping our Twinning Association create a truly fantastic tribute to this landmark event and hope the whole council will join me and get involved. I know it is going to be difficult trying to balance work, family and council commitments, but with the support from my council colleagues, work colleagues and my family we will make it through the other side with smiles on our faces and Hayle continuing on its journey to build a better future for following generations. This civic year will end with elections for a new council, please vote for me, I know some of our longest serving members are considering retirement, which will leave some big holes in our council. If anyone feels that they would like a go at becoming a councillor please come to some meetings, speak to us in the street and give it consideration, it’s a truly fantastic honour to serve your town, and even better to feel that sometimes you’ve done the right thing. There is no right or wrong person for the job, you don’t need to share the same opinions or interests of others, and a diverse selection of people is what makes a council great. This is best explained by the story that came from the recent Cornwall Council Camping and Team Building exercise held at Joppa near the treacle mine. When a situation arose highlighting how different two people’s interpretations of a situation can be. On the first night, after a meal and a few drinks sat around the camp fire singing songs, they all retire. Some hours later, John wakes up and asks his companion John. John thinks for a minute. “Well John, astronomically, it tells me that there are millions of galaxies and potentially billions of planets.” “Continue,” says John. “Astrologically, I observe that Saturn is in Leo. So you see we have two perfectly honest but very different opinions on a situation proving there is no right or wrong person for the role of councillor. Thank you once again colleagues, friends and Hayle. 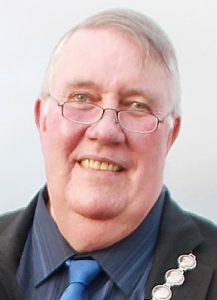 I’m Graham Coad, a St George’s Road boy, Hayle born, ex Penpol School, Humphry Davy School and then in Devon and Cornwall Police, where I served twice policing Hayle, (retired since 2004). 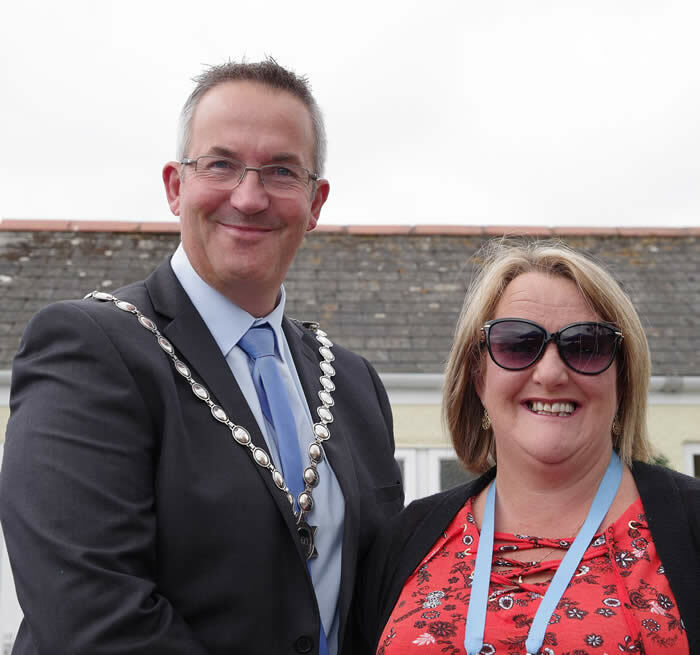 I’ve been on Hayle Town Council since I was elected in 2007 and thoroughly enjoyed it, having been chairman of Amenities Committee, and involved with several projects and working groups and deputy mayor, even editor of The PUMP for a while! I have lived back in Hayle since 1996, with a grown up daughter and grandson, Jenny and Cameron also living in Hayle, a son Tom in the Royal Navy, son Jonny in college and daughter Lizzie still a pupil at Penpol. I have also worked away, in Exeter, Plymouth, Penzance, Camborne Truro and Newquay so have some idea of how other towns and cities work. Mother’s side of the family, (Oateys from Foundry) were Hayle people back to the1600s while Father’s people came from the Callestick and St Columb areas, and I am delighted to be Cornish, and pleased that we are now officially recognised as a nation! Having seen jobs and industry collapse in Hayle in my teens and the dilapidation of the harbours and waterways, I too waited forty years for change and am proud to have been on the council and involved as we worked with Penwith and Cornwall councils to play our part in the planning process for the repair and renewal of Hayle Harbour, now well underway, and other smaller but important and useful developments. As mayor, and a politically independent town councillor, I hope to help keep Hayle Town Council working together for the good of our town and area, and maintain good links with our neighbouring communities. I would LOVE to see more people taking an interest in local politics as it directly affects the future of our town, Hayle Town Council meetings are open to the public and usually start with a public participation session. We welcome Hayle people to help us create the Hayle neighbourhood Plan to have a say in influencing planning and development of Hayle forward to 2030. In the meantime, please make sure you’re registered to vote and vote when you can, so you can help make a difference to Hayle! I would like to thank my fellow councillors for their kind words and for voting for me as Mayor. 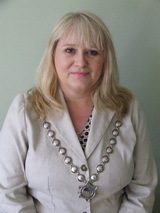 I am really honoured to represent the town council and the people of Hayle. Though I am sure some of my fellow councillors were motivated by the fact I get my own parking space so they don’t have to watch me reverse near their cars. I was born in a coastal industrial town which was no longer in its heyday. Traditional jobs in mining , ship building , fishing and heavy industry were disappearing leaving shrinking job opportunities and a beautiful coastline of sandy beaches with no ships. I was born not in Hayle but in the North East of England in South Shields near Sunderland .Elements of this will sound familiar and perhaps explain why I love Hayle so much. I went to university in York and studied Economics and Economic History. From York I moved to London to get a job and began a management training scheme and eventually moved to the South West region with Sainsbury’s. Whilst at Sainsbury’s I met and married, Jonathan and moved to Hayle from Exeter. After several happy years of working in retail management I moved to Cornwall College where I work in Human Resources Management. Cornwall College is a fantastic organisation which is now in the top 10% of Colleges nationally whilst remaining a truly open access College. It is a great example of what can be achieved when we raise our aspirations. As well as football my parents gave me an interest in politics and my community .My parents were teachers and involved in their community. They ran the local youth club at their church and I spent many school holidays as a child hiking from one youth hostel to another in the lake district .They would often take groups of children from difficult backgrounds away for the weekend and I learnt from them the importance of sharing what we have with those who don’t have it. Their love of working in the community rubbed off, their love of hiking didn’t. Whilst representing the Mayor at Camborne’s Civic Parade last year I heard a presentation on their food bank and thought it would be good if Hayle had a food bank too. With the help of my fellow Labour Councillor Anne Marie and Margaret Tanner we spoke to the local churches and found other volunteers who were also hoping to set up a food bank. We now open on a Saturday Morning in Hayle Methodist Church from 10-12. Donations can be made through CO-OP or through local churches . The town council are also trying to help our community by keeping the swimming pool open a challenge since losing funding from Cornwall Council. For many years volunteers from the town council and the town have supported the pool a community project which I fully support and would encourage others to join. There was always lively debate in our house as my parents had different views. I remember one incident where there was a protest on a prison roof being televised. My mum was very taken with the leader of the protest and liked to see him marching along the roof top giving orders to his fellow protestors. My Dad had a more succinct point of view and said the protestor should be shot as that would knock some sense into him. These conversations would go on often in our house on different topics. So I grew up believing in the redistribution of wealth and the liberal use of water cannons as central tenants of political policy. Some would say perfect training for new Labour of which I am a member and proud to be a Labour councilor. For me though what came out of this was a strong commitment to the labour party and the belief that jobs are the most important thing a system of government can provide. . My main focus will always be on what can we do to bring employment to our town especially high quality jobs such as we hope the new renewable energies park development on North Quay will bring. For me the vote on North Quay was easy even at the cost of a concrete bridge but the decisions on South Quay less so. Many of you will know that I have been one of the more skeptical councillors about South Quay – What we must all do now as a council and as a community and I will help do as Mayor is to ensure that we hold ING and Cornwall council to the agreements made. Overall I believe the development will be good for the Town , we have paid a price for it with houses on the Towans and a supermarket on South Quay , however if we get all that is promised in return , the crater in South Quay repaired , the reintroduction of sluicing and many more jobs in the town then Hayle is going places. If all is delivered I believe it is on balance an excellent plan for Hayle’s future. In addition being hopefully able to heat the pool soon, we have our own fire station coming making the town not just safer but bringing retained fire fighting jobs to the town and Harvey’s foundry phase 3 bringing more opportunities. Our Cornwall Councillors and out going Mayor John Bennett have achieved a lot and deserve huge credit. I hope I can live up to the example they have set. It is an exciting time to be in Hayle and I am very proud to be your new Town Mayor. The first job I had to do as Mayor was possibly the hardest role I will have to do all year as I had to choose the recipients of the Mayors awards. It was very difficult to choose from the excellent people put forward but after much deliberation it gives me great pleasure to announce. Margaret Tanner – I am sure many of you will know of the excellent work that Margaret does for the Hayle in Bloom , Churches together , Cancer Research UK in Hayle of which she is the treasurer , Hayle Food Bank , St Josephs and much more. I would like to share with you one comment from one of her nominations which I feel really explains why Margaret deserves this award “She is a remarkable lady who is constantly out and about working for the people of Hayle. It easy to appreciate her impact if you think what Hayle would be like without her as she has an innate ability to bring out the best in people she sees the potential in everyone and tries to make everyone feel good about themselves. Ladies and Gentlemen the award goes to Margaret Tanner. Malcolm Bryant – Citizens of Hayle and especially Angarrack will be very familiar with Malcolm’s achievements in helping to provide Angarrack with excellent Christmas lights, a community hall , and his work on the jubilee committee. One of his nominations describes Malcolm or Ernie “as a true legend of the village, a doer who gets involved totally in village life.” The award goes to Malcolm Bryant. Young person of the year 2012 is Emily Corin . Emily has been chosen for her marvellous sporting achievements having scooped all 3 national titles in surf skiing and 12 Cornish titles and at 16 won a European bronze medal and became a reserve for the GB open team. The award goes to Emily Corin. There are many excellent organisations in Hayle and this year’s award goes to one of the very best , the Hayle Dare Care Volunteers presented to Lesley Channel. As stated by one of their nominations “the volunteers support by helping in the kitchen , acting as carers on the mini bus, entertainers throughout the day engaging clients in art , games and entertainment. They also fundraise for the centre. Without these volunteers the very existence of the centre would be in doubt” I am thrilled to name Hayle Day Care Centre volunteers as organization of the year. Hayle Youth Club. The Youth Club is an excellent organisation where the young people of the town have a wide variety of activities including their own radio station. One nomination describes how the young people take responsibility for their club and run it for the benefit of all. To collect the award and tell us a bit more about the club is Craig Walker and representatives of the users of the youth club. Thank you very much to all who nominated and all who won.